When we work with reputation management clients one of the most common things we hear is, “If it weren’t for those angry folks on Yelp.” One of the biggest myths is that there is a legion of angry folk on Yelp, and other review sites, just looking to destroy a business. Sure, there are some who are a bit ridiculous in their reviews. But it’s easier to believe the keyboard warriors are malicious than face the truth. This week we’re breaking down one business’s reviews to understand how they could improve before the bad reviews affect sales. Are You Harming Your Biz’ Online Reputation? It’s frustrating to get bad reviews but they are an important part of your overall SEO strategy and can make or break your business. Many businesses ignore them completely or respond hastily. But there is a better strategy. It comes down to reading and really understanding those bad reviews. The business in this example is an event space in a suburban area known for bringing in great musical acts. They have over 200 reviews on Yelp. Lately, many of them have been pretty bad. One area of complaint is the venue’s policies. If a policy is causing problems, it is worth reviewing. The easiest way to start is to see if there are policies are mentioned in the review and then decide if customer complaints are reasonable. 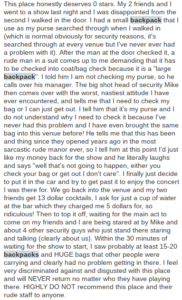 In this case, the patron is upset because she was asked to check her backpack per a no backpack policy. While her frustration at other large items makes sense, she was clearly wearing a backpack which is a violation of the policy. 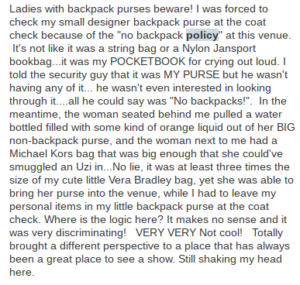 In this case, the patron provides that she saw at least 15-20 backpacks. Even if she is exaggerating, we can assume she saw some, since she provided a number. This warrants the venue to take a closer look. Are staff implementing the policy properly? Is it accessible? The information on their website includes that backpacks and large bags must be checked. It would be more helpful to say “bags larger than” followed by specific dimensions. Or warn people on the website that there will be a certain size container at the door and, if a bag doesn’t slide right in, it needs to be checked. Patrons who know a policy exists are more likely to follow it. They also generally won’t bash a place if they see a rule being enforced across the board. This venue does not appear to be doing that. While the website does include information about bags, one has to expand the “Is Coat Check Mandatory” section in order to find it. This policy would make more sense under a section on rules or safety. Further, it’s unclear what a “large bag” is. Another good option would be to add the word “all” before backpacks. While only mentioned once in the Yelp reviews, the venue definitely has a pattern of unclear communication and loosely enforced policies. This is leading to negative reviews. Management and staff should sit down to hammer out what the rules are and how to communicate them more clearly. Then they can institute an in-house backpack policy that is strictly enforced. During a Battle Of The Bands event, it was wearing shorts that became a problem. First, there is no mention of any dress code on the website. Saying “We can bar anyone from entering at our discretion” doesn’t really help in this situation since they cited the non-existent dress code. Especially when multiple people were already inside wearing shorts. The attitude of the staff involved calls into question whether they understand the importance of standard policy enforcement. Suggesting someone buy pants or that the patrons who snuck in are allowed to violate the rule is problematic. Make a habit of going through Yelp and Facebook reviews and looking for patterns. It may be time to communicate better through social media and your website. Also, it’s a good idea to provide staff with regular reminders on policies and how to best enforce them. Digital Firefly Marketing manages online reputations for businesses large and small. Contact us for your free reputation audit today.